Stomach bloating is a condition that causes your abdomen to feel full and tight. It can be caused by any digestive system disorder that causes intestinal inflammation or obstruction, such as irritable bowel syndrome. Food can also be the culprit. For example, fatty foods are often associated with abdominal distention because they delay stomach emptying, giving you a sensation of bloating due to excess gas in the large intestine. Many people tend to experience bloating after consuming milk and other dairy products. 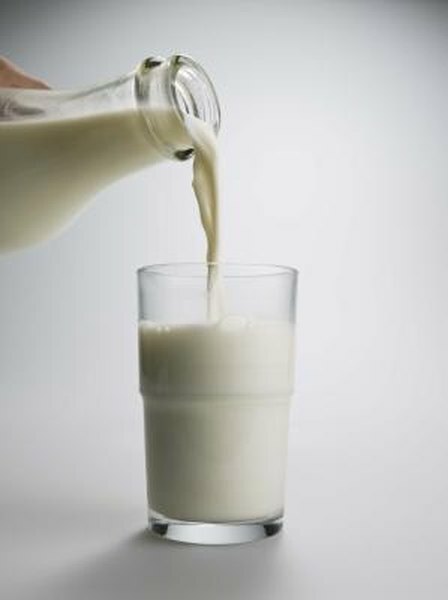 Dairy contains a type of sugar called lactose that some people cannot digest because they are deficient of lactase -- an enzyme that’s needed to break lactose down. When lactose remains undigested, it’s broken down by bacteria in the small intestine, which can lead to abdominal discomfort, gas and bloating. Consumption of cruciferous vegetables, such as cabbage, broccoli, cauliflower and Brussels sprouts, may cause abdominal bloating or a feeling of abdominal distention. These vegetables contain a complex sugar called raffinose, which is normally associated with excessive gas production in the intestine. Some individuals also have problems with bloating after consuming leguminous foods, such as beans, peas and lentils. Legumes produce the largest amount of gas. Therefore, people who are intolerant to the effects of excessive gas must keep the amount of legumes in their diets at low levels to avoid severe stomach bloating. East Carolina State University: Do You Suffer From Excess Gas and Bloating?